Let us explore the dark underbelly of gaming. Lurking within every colorful box is the potential for anxiety, anguish, and aggression. Cloaked behind phrases such as "fun filled," "intense," and "challenging" we see wicked counterparts such as "pain," "stress" and "revenge." Ahh...enough of that. Let's see photos of your gaming related injuries and property damage. It doesn't have to have been intentional. Charred remains of...anything? Post it. List the game that was being played, a short story about what happened, and any photographic or other documentary evidence (link to a police report?). It was the summer of 2010. This was the year that my closest group of friends, a bunch of six guys who'd been together from middle school, all turned forty. One of our group rented a vacation house and off we went for a weekend of fun. After a day of guided fly fishing, we headed back to the house where I fired up the poolside grill and cooked up a huge batch of spicy jerk chicken, along with beans and rice, fiery coleslaw and more, all chased by a selection of ice cold beer. Later that evening, we retired to the long country table in the kitchen for some games. Oh, and quite a bit of tequila. 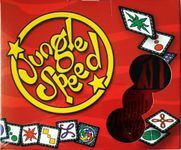 Jungle Speed fit our moods perfectly--fun, social, fast and a bit crazy. Everyone was laughing, particularly when the totem was occasionally launched across the room by the overzealous players. It was in them midst of this mayhem that I took the hit to my thumb. Things would never be the same. Nah, that would be ridiculous. But I did get gouged pretty badly by my buddy who apparently was in need of a manicure. Check it out below. My mother-in-law is in the hospital with DVT. Seems hours of playing cards is responsible for throwing clots into her lungs. (Pulmonary Embolism) It was a little mysterious for a few minutes as the doctor almost accused her of lying about being on a recent long trip in an airplane or bus w'ever. My wife actually offered the card-playing idea knowing she plays a lot with friends at her senior center and, since my MIL is also kinda short, the doctor said that sitting for an extended period with her feet just dangling is what led to the clots. weird. probably a good idea for folks to get up from their chairs occasionally during long gaming sessions, and/or take some aspirin! i also can't help wondering if anyone here has actually had a child or pet choke on a game component? What about those 'thrift store' antique games? Any of them have lead paint on their parts? I suppose a firse could be starterd by Waldschattenstein or Feuerberg.